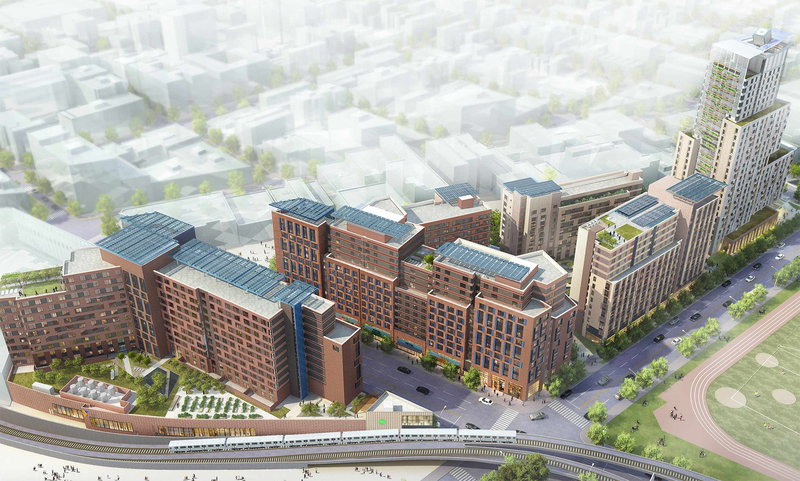 Bronx, NY Construction has started on two buildings at La Central, a $335 million, 1.1 million s/f mixed-income project. NYC and NYS officials joined the leaders of BRP Cos., Hudson Cos., ELH-TKC, Breaking Ground, Comunilife and the YMCA of Greater New York and other project partners to celebrate the groundbreaking. The two 100% affordable buildings, located at 556 and 600 Bergen Ave., will be 12 and 13 stories tall and include 496 new apartments that will be affordable to extremely low, very low, low, and moderate-income households. Of these, 220 units will be permanently affordable, due in part to the city’s Mandatory Inclusionary Housing (MIH) policy. The apartment mix will include studio, one, two, three, and four-bedroom units. These sustainable buildings will generate 250,000 watts of power through the use of rooftop solar panels, and will include retail space on the ground floor. In addition, a new YMCA facility, a BronxNet TV studio and a rooftop garden will be accessible to residents and the community. “La Central will be a vital resource to the community, not only by creating hundreds of new mixed-income affordable units, but by cultivating social centers like shared gardens, community farms and a new YMCA. We have been working directly with members of the community in order to ensure that this transformative development will be a true community hub,” said Meredith Marshall, BRP co-founder and managing partner. “Our vision for La Central ‘To leave no square foot unturned’ becomes reality starting today. With affordable housing powered by sustainable energy generation, community and educational space for all ages and vibrant recreational space for the neighborhood, La Central will be a hub within The Hub for the South Bronx community. We thank our elected officials, Community Board 1 and our partners in government and the private sector for their commitment to and investment in La Central,” said Aaron Koffman, principal of Hudson. “Hundreds of Bronx families and individuals will now be able to access new affordable housing units, recreational facilities and economic opportunities at the new 1 million s/f project La Central. Those of us in public office in NYC know there is a pressing need for affordable housing, particularly in areas like the Bronx. I thank and applaud Mayor de Blasio for this issue a priority through the Housing New York initiative and for working to help the Bronx,” said congressman Jose Serrano. “I am proud to see the commencement of construction for La Central. This construction project is specifically tailored to meet the needs of our community. The 496 units of mixed-income housing is a tremendous step towards meeting the desperate need for affordable housing in the South Bronx. This project now sets the standard in our area and we look forward to see the new YMCA facility, the BronxNet TV studio, and the public rooftop. The solar panels and community garden on the rooftop show the commitment to sustainability and maximizing the community involvement in the space. On behalf of our community, I would like to thank all the stakeholder for making this possible and I look for to working together to meet the needs of the families and individuals that we all represent,” said assemblywoman Carmen Arroyo. “Today’s groundbreaking marks a big step forward in our push to ensure New York families have a safe and affordable place to call home for decades to come. La Central was one of the first projects authorized under our mandatory affordable housing reforms, and it means nearly 500 Bronx families have a good shot at reaching and staying in the middle class. With open space, jobs and new community services, this project will make the whole neighborhood stronger,” said deputy mayor for Housing and Economic Development Alicia Glen. “Through Housing New York, we are harnessing the city’s precious remaining sites to pair much-needed affordable housing with the other opportunities that residents and communities need to thrive. This second phase of La Central will provide nearly 500 affordable homes that serve households at a range of sizes and incomes, as well as create recreational and commercial space in a dynamic large-scale development that adds to the vibrancy of the neighborhood. I’d like to thank our partners in City and State government and the teams at Hudson Companies, BRP Development, and Kretchmer Companies for all their hard work on this project and their commitment to building a more affordable, sustainable New York City,” said HPD commissioner Maria Torres-Springer. “This development is emblematic of our efforts to promote economic opportunity, healthy living, sustainable design, and lasting affordability on the city’s remaining public sites. Projects of the scale and complexity of La Central would not be possible without significant support from all levels of government. I congratulate our many partners, public and private, for their vision and dedication to this transformative development and the Melrose community,” said HDC president Eric Enderlin. “Today marks a major milestone in bringing a dynamic mixed-use affordable housing development to The Bronx Hub. One of the largest projects to use the city’s Mandatory Inclusionary Housing program, La Central is unique in the broad range of amenities it offers to meet both local and borough-wide community needs. Bronx residents will have a better quality of life because of the collaborative community-based planning that underpins the transformation of this city-owned site,” said City Planning Commission chair Marisa Lago. “La Central represents the best of what we ask for in new development in our borough. 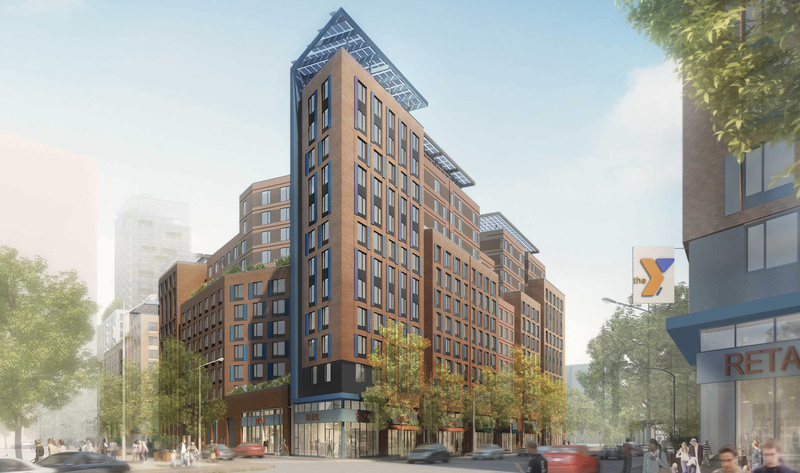 This project will provide hundreds of critical new housing units at a variety of income levels and sizes, new retail space and outstanding community amenities such as a rooftop garden, studios for Bronxnet and new YMCA recreation center. I was proud to have provided this project with $1.5 million in capital funds, and I look forward to welcoming tenants to La Central upon the development’s completion,” said Bronx Borough President Ruben Diaz Jr.
“There is an incredible need for new and affordable housing in my district, which is why I’m excited to celebrate today’s groundbreaking at La Central. From new community and green spaces to vibrant retail, this mixed-use development will be tremendous for the Melrose neighborhood of the South Bronx and greatly serve the needs of my community,” said Council Member Rafael Salamanca Jr.
“We are thrilled to be part of this important project providing recreational and community space to South Bronx residents. It’s been a long-held dream for New York City’s YMCA to expand in the Bronx, a vibrant a vital part of the city. Here for all New Yorkers, the Y is committed to empowering youth, improving health, and strengthening community. With a new centrally located, state-of-the-art facility at La Central, we will be able to serve even more youth, families and seniors. We look forward to working with our Bronx partners and neighbors to bring this project to life,” said Sharon Greenberger, president & CEO of the YMCA of Greater New York. “The Bronx is experiencing tremendous revitalization, and for over 25 years BronxNet continues to be a part of the resurgence. Our presence and services at La Central represents a very significant next phase of our public engagement. BronxNet is proud to contribute to the viable growth of the Melrose, Mott Haven and surrounding Bronx neighborhoods. We are confident that Bronxites from the immediate area and beyond, will utilize our accessible resources to benefit the people of the Bronx for years to come,” said BronxNet chairman Paul Gentile. BRP Companies, Hudson Companies Inc., The Kretchmer Companies, ELH Mgmt LLC, Breaking Ground, Comunilife and the YMCA were selected after a 2013 competitive Request for Proposals process to develop the Bronxchester Urban Renewal sites in the Melrose neighborhood. This is the second phase of the La Central development which will ultimately be a five building new construction project on one of the largest formerly city-owned properties remaining in the Bronx. Overall, La Central will have a total of 992 mixed-income affordable apartments. Construction on the first phase of development began last June. The 9-story, 161 supportive housing building is expected to complete construction in July 2019. The second phase of La Central was financed under New York City Mayor de Blasio’s Housing New York, a Five-Borough, Ten-Year Plan. The plan aims to build or preserve 300,000 affordable homes by 2026. Since its inception in 2014, the New York Housing Plan has financed over 87,000 affordable homes. Units at 556 and 600 Bergen Avenue will be available via a lottery, with maximum income limits ranging from $20,040 to $80,160 for individuals and $30,930 to $123,720 for a household of five. In addition to solar panels, the buildings, designed by FXCOLLABORATIVE, in collaboration with MHG Architects and Future Green Studio, will feature grey- and black- water recycling and natural gas-fired cogeneration. La Central was financed under HPD and HDC’s Extremely Low and Low-Income Affordability (ELLA) program, the project represents a total investment of $335 million in public and private funds. HDC provided more than $124.9 million in tax-exempt new volume cap and recycled bonds. HPD provided $89.5 million in city capital funds in addition to four percent Low-Income Housing Tax Credits (LIHTC) which generated roughly $101.7 million in tax credit equity. An additional $8 million in Reso A funds were committed to this project, of which $6 million is credited to the city council and $1.5 million is credited to the Bronx borough president’s office. Wells Fargo is providing the letter of credit and is serving as tax credit investor.